Android (s goog) owners haven’t seen a major software update since the arrival of Honeycomb in February, but iOS devices are about to see one this fall. 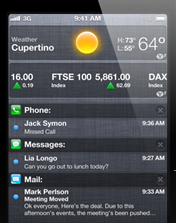 Apple (s aapl) has introduced some of the new features that iOS 5 will bring to current and likely new iPhones soon. Why talk about iOS in a weekly column on Android? Apple’s enhancements could sway potential Android owners over to an iOS device, because Apple has addressed some of the key shortcomings of the platform, in my eyes. The new Notification Center in iOS will look very familiar to Android users: Swiping down from the top of any screen in iOS brings a listing of all current notifications, along with interactive widgets for weather and stocks. Overall, incoming notifications are far less disruptive on iOS 5, appearing on top of the current screen for a few seconds and later disappearing from view. Twitter is integrated directly within iOS 5, making it easier to tweet information such as photos, maps and browser links. Android still excels here in my opinion, because most third-party apps are automatically integrated into the platform’s sharing function. Apple devices also gain music storage in the cloud, but I personally prefer Amazon’s Cloud Player (s amzn) for Android. Unlike Apple’s solution, music can be streamed on demand to Android smartphones and tablets. Wireless syncing arrives in iOS 5 and will be welcome, as will the new iMessage application. This software sends direct messages to other iMessage users on iOS, complete with read receipts, and is similar to an instant message client. For non-iOS users, iMessage sends a text message. The software may cause a few to reduce their text messaging plan, depending on how many of their contacts use iOS devices. Before iOS 5 arrives this fall, many will choose a new smartphone, however, and Sprint (s s) led the pack with two new smartphone announcements this week. The $199 HTC Evo 3D arrives on June 24 and appears to be a high-end handset based on the hardware, also adding a unique dual-camera sensor that captures 3D images. No glasses are needed to view the 3D images, thanks to a 4.3-inch, stereoscopic 960 x 540 display. 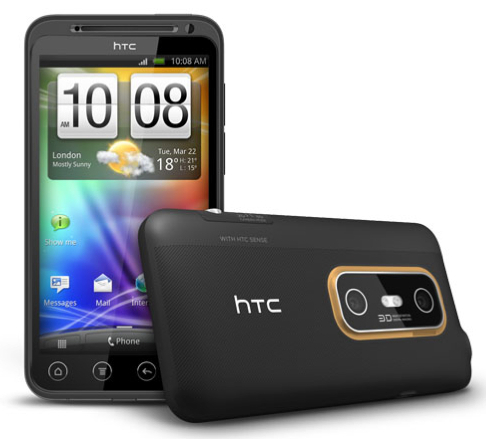 The Evo 3D launch will be complemented by a tablet: HTC’s View, a 4G version of the HTC Flyer, arrives the same day for $399 with contract. Sprint customers will also have more Motorola (s mmi) devices to choose from, as the two companies announced a renewal of their partnership this week. A dozen or so devices will arrive this year as a result, but the flagship phone looks to be the Photon 4G. The WiMAX-capable handset works domestically on Sprint’s network but acts as a GSM world phone outside of the U.S. A dual-core processor, 4.3-inch display, 8 megapixel camera and included kickstand round out the key features. And for those who prefer a modular mobile solution, the Photon 4G will fit into a laptop-like dock, similar to the Motorola Atrix 4G we reviewed in February. 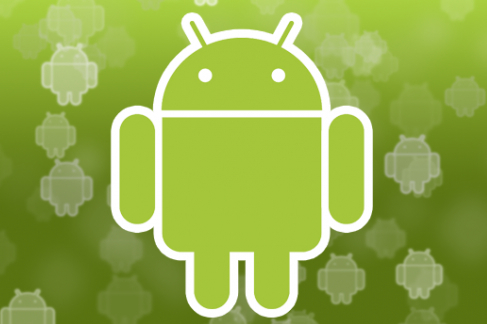 Regardless of the Android phone you carry, the Android Market gained a small but useful enhancement. On the web-based Market site, Google now shows if an application is compatible with your registered devices. This can help eliminate the wasted time of installing software only to find out it doesn’t work well with a particular handset or tablet. I have a Google Experience cell and an iPad Tab. These two together give me the best of both worlds IMO. The Phone can do it all and has more features than iPhone including free tethering to feed my pad, flash capability for a lot of important websites that I frequent, and extremely customizable. The Tablet has more Apps than any other Tablet and better battery life than they others but I still need my PC for heavy lifting like ripping a DVD and re-authoring it but the Tab fails at simple task too like automatically doing a language translations with email or adding an attachments in email. I too think in the long run, Goog/Android will be the market leader in both markets, because unlike Apple who now chooses to improve on old ideas, Goog is actually doing R & D with software and beta testing it out in the field! see something right will coming soon. but apple fight back with her Ios5. remember android have many user now. also me and my friend too. How is android winning. They are taking over symbian users. Not taking iPhone users. Destroying the arguments in your post would be nice but a complete waste of time, fanboy. I doubt you had an android-based phone in your hand for more than 30 seconds. Not destroying it at all. I think android and iPhone will live together, as my post said. I am happy for the layers to be out there. But, you have to be realistic and say yes, android is growing and fast, but in what element of the market. It is not taking apple share, it is taking symbian share. I am just using facts, not making up a story, just looking at the data that is being dispelled by Gartner, who are a recognized company in this. As a software developer I am trying to work out who will win. Because it costs me less money. Actually, Android users remind me of the 1990s Mac fanboy. The platform is inferior in so many ways, mostly the lack of apps, yet the phandroids hoot and holler about Android having more market share, which is a lie, and other fabrications. At least Guy Kawasaki wasn’t a liar. Phandroids make the 1990s Mac fan boy seem sane. I think that the EVO 3D is going to be a huge leap for technology. I can see other 3D devices being a hit too later on. I can’t see anything iPhone can do to attract me (well besides a huge form factor, which is very unlikely). There are 3 months or more to get to the next iPhone where before and after Android will just keep on getting better. One manufacturer vs. an ecosystem. I prefer the later. T3 is planned for as early as this Hanukkah (err Christmas), the prospects that Andy Rubin is bringing us news around the Gtalk ecosystem, etc. iPhone by definition will be the OS that is catching up. This story needs a fresh edit. Typos abound. I looked it over, caught a few and fixed – thx! The “shortcomings” of Apple, is what drove me away. Whether they have been addressed or not, I tired of spending top dollar on a next iteration that could have been in the previous. These features should have been offered over a year ago. That is how Apple preys on consumers and why their customers are called sheep. They provide just enough and hold back on programs, and still get customers to purchase a next product. I will never understand why their following continues to support this practice. Apple rakes in billions upon billions of dollars by omitting key features. What do Apple lovers get in return? The gift of waiting to enjoy what everyone else already has. Yet, their clan fails to acknowledge this. Even with a less polished Android OS, I’m at least more satisfied with being able to maintain a non rooted phone to keep it insured and not have to worry about having the most newest, updated needed features. I gave Apple a second chance after leaving them many years ago. The second time proved no different. Take as much of my money as possible and give me the least possible. So what fell short in IOS other than maybe Widgets? I use both platforms and while they are different I don’t understand the “Apple preys” part, what features are omitted?. From a user perspective Android does not appear to be any more or less open than other platforms. At the end of the day its all about the apps and utility of the device. And I don’t think either platform has failed in that respect. From a price point they are equal, carrier rates are the same on both platforms, cases cost about the same. What am I missing other than fanboy ranting? Actually, Android is far more open. Wireless updates, as an example, means that I don’t need specific software to maintain my phone. As a Linux user, an iphone wouldn’t just require me to use itunes, I’d have to change my desktop OS. The standard usb connectivity also allows me to just drag and drop music to my device (which isn’t actually that hard) and the replaceable sd memory and batteries makes the iphone look a little closed as far as I’m concerned. This point has been addressed in countless articles and blogs but apparently you missed it: features are important but performance and the overall experience are what matters to most consumers. A few Android devices are making good headway, but for a majority of users, you still can’t beat the performance, stability, elegance, and user-friendliness of an iPhone. THAT’S why Apple still rules. “…most consumers… majority of users.” What’s this majority you speak of, seeing as Android is the more popular smartphone platform? Uh, David McPhandroid — at the end of Q2 Larry Page announced 135m total Android activations. About 2 weeks prior to that, at the WWDC, Apple announced over 200m iOS users, which is at least verifiable by phenomenal sales. What you have bought into is the Phandroid blogosphere hype. Yes, if you have tunnel vision, block out the iPad, look at smartphone sales in a few quarters, only in the U.S., using surveys that have sampling bias towards low income people with lots of free time… Then you can fabricate that Android is a dominant OS. But iOS has more users, and the iPad counts — unlike Honeycomb, iOS on the iPad can run all iPhone apps. Sorry, but Apple built the better mousetrap, and the world is beating a path to their door. I don’t even see iPhone or iPad commercials anymore, but lots of Droid commercials. The iOS products are so great, they sell themselves. your measuring inches of Droid features as yards of iOS tech gap when the distinctions are actually minor. Apple just ships more mature tech (ie. it works)and the public has responded to the point of Google copying huge swaths of the Apple design: see the first Android (looks like a Windows-Blackberry kluge). My beef w/ the G men is they have abdicated an economic proposition for developers unless your tied to their Ad-centric machinery. Devs of iOS make 1000x more than the Droid versions (eg. Rovio), pulling quality creations to Apples’ ecosystem and leaving rip-offs and hobbyware to swell Googles’ Marketplace. Giving a phone w/ purchase of one is a way to increase eyeballs, but attracting ‘free loaders’ and pirates leaves serious developers shunning Droid. Apple prices are comparable and software dirt cheap, yet devs are making money. Do we need 1000x more Droidlings to make hte same money? Apparently, if you read the nerd blogs. This sounds ridiculous on the face of it and many fans of the Android have no answer. Also… How open IS Droid when Google only reveals their latest code to select groups at their ‘open’ meetings? Not very, and this was predictable. iOS has always been ahead of Android in many ways. If you are biased, you can put your finger on the scale and sway the balance to eiter device. You know why Netflix, Hulu, Skype, and others have had so many problems and had to roll out their products to select Android devices, a year after iOS users have had these? Because Google felt that widgets and animated wallpaper were more important than a standardized media playback. Also, developers of video games, such as Electronic Arts have produced many more quality video games for iOS, and their Android offerings are weak and limited. iTunes? Android is missing the world’s biggest music store. Also, a lot of these neat features in Android are in gingerbread. Many Android users have just got gingerbread this month, like HTC Inspire users, even though the OS was launched several months ago. If you are unlucky and bought the wrong Android device, you may wait and wait, and maybe never get an update.